Cate: The Romancing your Dark Side Tour wraps up today with BK Walker. Please give BK a warm welcome. BK, will you please share a short bio with us? BK: Sure Cate. First, thank you so much for having me at your blog today. This tour has been so much fun. In a nutshell, I'm a nurse, a single mother of 3, a writer, friend, and nurturer. I've been working as a nurse since 2001, had my first book published in 2009, and my oldest just turned 21, which is a whole new set of worries in itself. Cate: Tell us about Night Secrets and where it's available. 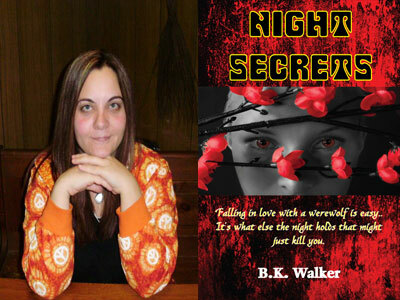 BK: Night Secrets tells the tale of a young girl grieving from the loss of her parents. When her mysterious Aunt comes to live with her, strange things begin to happen not only around Keara, but to her. She will learn of her true heritage, she will go through a process of where she will learn the truth about vampires and werewolves, not to mention that she will fall for a hunky wolf herself. It's available right now at Amazon.com and only in E-book format, though it will be going to print soon. “A vampire? A real vampire?” I finally asked. “I knew they were real! I suppose werewolves and warlocks are real too huh?” Channing looked at me quickly then looked to Corbin. “They…Are…Real?” I choked out. Corbin smiled trying to make it seem better than it was.“That’s why you keep calling Channing dog? He’s a werewolf?” I looked at my hand in Channing’s. He let go, not sure if I wanted him touching me. “So what are you going to tell me next, that I too am a dog?” I looked quickly at Channing, “Sorry.” I felt my face flush, open mouth and insert foot Keara you dummy. “What! A shape shifter? What are you talking about Corbin?” I demanded looking at Corbin then Channing. so that it’s easier for the bones to move and realign as they need to. What is left after a full shift takes place is a puddle of sticky slime. You didn’t fully shift though, you only shimmered and that is why you were covered with it instead of leaving behind a puddle.” He smiled. Cate: Intriguing! Can you tell us why we're going to love your hero? BK: She's strong, witty, fears nothing. We watch her fall in love for the first time and accept it with open arms even as she finds out her destiny, fights a deranged vampire and deals with magic for the first time in her life. As she goes through the motions, she will only get stronger and stronger. I think readers will be able to easily relate to Keara. Cate: Love a feisty heroine. :) Tease us with one little thing about your fictional world that makes it different from others. BK: I like to mix up the paranormal elements. You will always find more than one supernatural creature, besides a werewolf or vampire. Cate: Very cool. What's next for you? BK: I have several projects in the works. I'm hoping to release Broken Captive later this month. Definitely not a paranormal, but about self mutilation. Cate: What inspired you to draft your first story? BK: Voices in my head. I kept hearing this girl and seeing scenes from her life. Eventually I had to write it, if for nothing else than to simply to keep my sanity. Cate: Do you have a writing routine? BK: Not at all. I write when the muse strikes and many times I argue with her. I often write as a panster, but when the muse and I struggle, I will use post it notes just to keep me in the right direction. Cate: Where can readers find you on the web? BK: What is your favorite thing about reading romance, whether paranormal, sweet, contemporary or erotica? Cate: Readers, Romancing Your Dark Side Tour is giving away a virtual gift basket chock full of goodies at the end of this week to a random commenter... so start commenting and be sure to leave your email address. They'll pick a winner on Sunday, August 25 and announce the winner here. Thanks so much for being my guest BK! Best of luck to you. 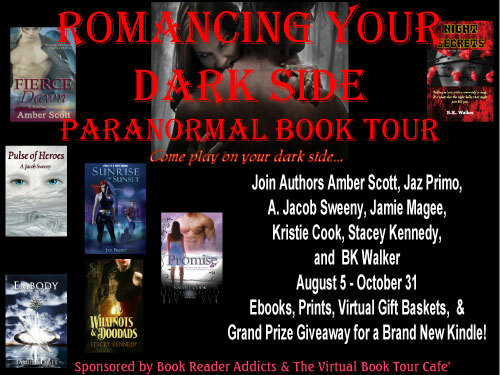 Guys, don't forget to check back tomorrow for another interview as the Romancing Your Dark Side tour continues! This may sound silly but reading these types of books fills me with hope of a happy ending:) Thats why I love to read. Its a great escape from reality! Thanks for the interview BK. Can a rejection be valuable? 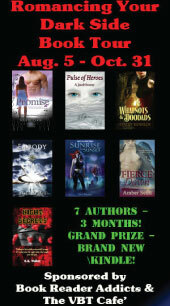 Another chance to win Surfacing! Thanks for making Blogfest such a success!